A relative of mine was recently the target of a timeshare resale scam. I became involved and was nearly fooled into thinking it was a legitimate deal until some things started to smell. I thought a recap with some lessons learned might help somebody out, so here it is. I should start by sharing a few pieces of advice that I gathered from reading articles and talking to some very helpful people at places like the Federal Trade Commission (FTC). In this particular case, the timeshare was located in Mexico, so some of these tidbits might be slightly more relevant to that context. Most timeshares are only worth pennies on the dollar from a resale perspective. The odds of an agent being able to actually generate a profit for you via a sale are extremely slim. ANY such offer that involves the payment of funds up-front should raise lots of red flags. Wire transfer requests, especially those to a particular individual, are almost certainly a scam. Don’t be fooled into assuming that companies that appear to be operating in the US are actually operating in the US. It doesn’t take much to stand up a website and look very official. Letter of Intent — included purchase price, timeshare location, number of weeks, etc.. This has the effect of building credibility because they had all this information to start with. Sales Agreement — Very official looking agreement, complete with my relatives address, which they had. Very well-written agreement language. We had a financial adviser review it and it passed the test. They are very good at making modifications to the sales agreement to fit your terms, always using appropriate legal language. The real estate agent then introduced another company: The escrow company. In the US, this is a familiar concept as escrow companies are involved to hold monies as an independent third party. 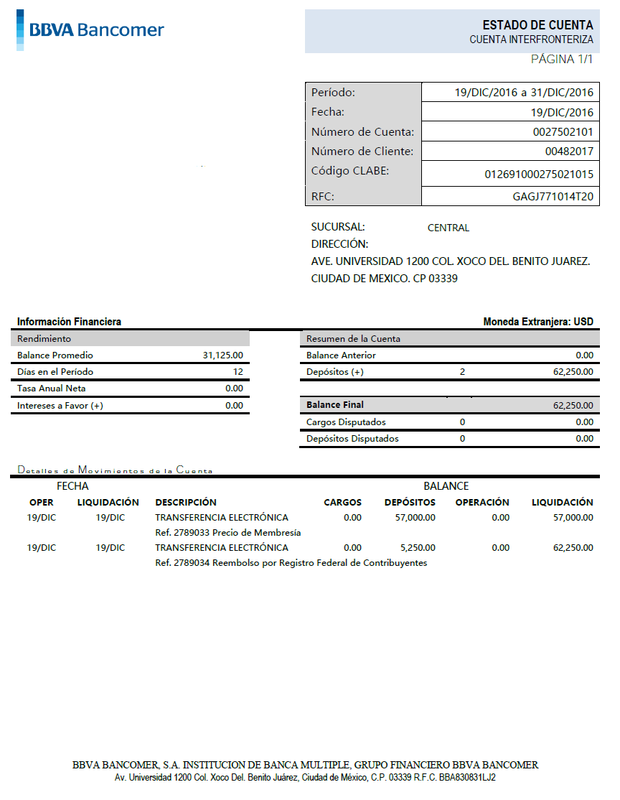 The escrow company initially provided an Account Opening Request document that was in Spanish and very official looking. They even graciously supplied a translation document. Escrow company would coordinate with a attorney in Mexico to get an “SRE Visa” permit from the government to allow for the transaction to go through. We were highly suspicious of this deal at the beginning, but I decided to play along and see how far they could go, without paying them a dime of course. Ask for license information and research it. I asked the agent for his real-estate license and was sent a PDF print-out from the California brokers website. I performed the same lookup based on the license number and it was a legit number. There were no negative comments on the record but there was also no contact information listed. This is exactly what the bad guys expect because they rely on most people to stop there. However, I proceeded to google around and found the actual agent and it of course was not the same person — I kindly called the fellow and let him know that somebody was impersonating him. Could he have been involved as well? Yep. It’s till not wise to give out any information to such people. I did a quick WHOIS search and noticed that the domains for the real estate company and the escrow company where registered with the same email address through the same hosting company. In Mexico. The escrow company finally sent me the money-maker — the wire transfer request. The beneficiary was listed as an individual. This fact alone will likely cause most major banks (bravo PNC!) to refuse to do the transfer. If you go that far, don’t be mad. They probably are saving you from being taken. Write thank-you cards. This document (we don’t know if it’s genuine or not) is issued by the federal government authority of education (SEP = “Secretary of Public Education”), a legal document that is required to exercise your profession after satisfactory completing your college studies in a University. It says that he has a “Degree in Foreign Relations” (ironically). It includes the CURP that is kind of a Master Identification Number that uniquely identifies each Mexican citizen. 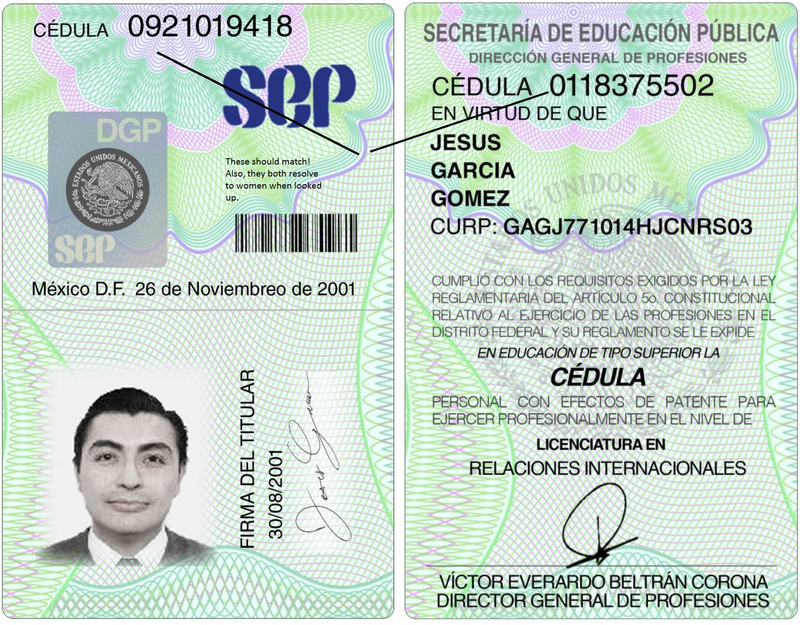 In that “CURP” you can find that he was born on Oct-14–1977, so he is almost 40 years old, originally from the state of Jalisco (the same state where Puerto Vallarta is). In that CURP the “NRS” letters doesn’t seem to follow the right pattern. After checking in the “RENAPO”, (Official Government webpage to query CURP data) I can tell that the CURP doesn’t exist. After checking in similar system of the Secretary of Public Education (SEP) the two “CÉDULA” numbers correspond to two different ladies that seem to not have anything in common apart of the fact that their gender is not male. Completely different States, dates, degrees etc..
Of course, the escrow company even arranged for “Jesus” to call me to make me feel better about sending him a wire transfer. The number originated from Mexico and everything! I didn’t answer. There are multiple places that provide great information on scams and you should include them in your research. When I talked to an attorney at the FTC, he referred to this as a “whack a mole” problem because these scammers can setup fake businesses, websites and forms very quickly. Once they reach a critical mass of negative feedback, they move on to the next identity. They nearly always pick company names that closely match existing reputable companies. The best defense is to educate people to spot these jerks on their own. When we don’t share information, the bad guys become more powerful. After I filed all the claims, I called the agent one last time to let him know that I had been on to them for a couple weeks. He, of course, played the part and denied it to the end. I did take the opportunity to let him know that I recognized him as a human being and let him know that I was deeply disappointed in how they were taking advantage of people. I told him I hoped he would make a choice to get out and turn his life around.